The nightshades we know best are tomatoes and potatoes, but eggplant has its own rightful spot on the list. Bulbous with waxy, shiny skin, eggplant can be a little daunting -- and that's not mentioning the spikes that can grow on its top stem! Beneath that tough exterior, though, lies creamy white flesh waiting for you to blitz into dip or simmer into sauce. Today we tackle eggplants -- also called aubergines, also called delicious. 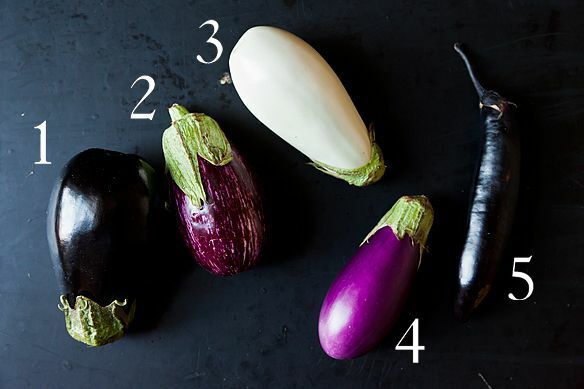 The Cast of Characters: Eggplants come in all colors and sizes. We tracked down as many as we could at market but by no means all -- don't forget round, green-striped eggplant, or thumb-sized fairy tale eggplants! When shopping, pick smooth, blemish-free eggplant that feel light in your hand (heavier ones will have overly developed seeds). Your thumbnail should barely make an impression in the skin. If it bounces back, then the eggplant might be overly mature. 1. Black: These are the textbook example of an eggplant. 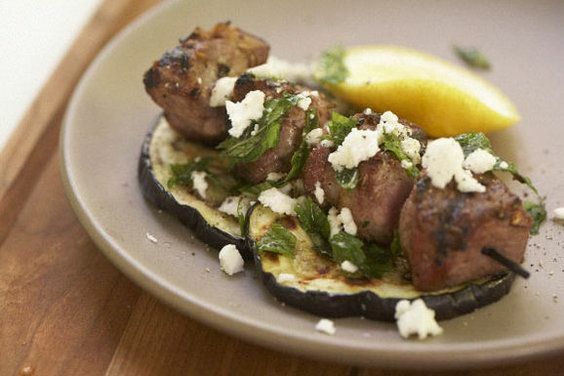 Their round shape and large size makes them perfect for grilling (no fear of your eggplant slabs falling through the grill grates!) or roasting (with a large inner volume, you get more bang for your baba ghanoush). Their darker skin can be tough, so peel it away if it seems too thick. 2. Bicolor: This is an Antigua eggplant, an Italian heirloom variety. Mild and tender, they grow small enough that the skin stays thin and easily edible. 3. White: Originally, purple varieties of eggplant were called "aubergines" for their round shape (the word comes from old Spanish and French words for peaches and apricots, although later the "aubergine" came to mean "dark purple" as well as to refer to the plant) and white varieties were called "eggplant" for looking like, well, eggs. While "eggplant" caught on for all varieties, the white version is still around and worth a try. They're sweeter and less bitter than darker varieties because of their pigment, and their thanks to their ghostly shade, they won't mar the color of your tapenade. 4. Purple: From violet to light pink, there's an eggplant for every shade of the purple spectrum. Try buying one of each at the farmers' market and see which you like best. 5. Long and Skinny: Alternately called Japanese, Chinese, or Asian, these long and skinny eggplants can be darkest purple, violet, white, or light green. What they share is a high ratio of skin to inner flesh, making them great for stir frying (with less inner surface area, the sliced eggplant won't fall apart), pickling, and even tempura. They can toughen quickly, so pick smaller ones no greater than the size of a sausage in width. 6. Seedy characters: Overripe or large eggplant can taste bitter, and its spongy texture can absorb oil like nobody's business during cooking. Solve both problems by salting your eggplant before cooking -- cut it as directed for your recipe, then toss the pieces with a tablespoon or two of kosher salt and let it all rest in a colander. (If the pieces are very large, you can weigh them down with a heavy can or skillet.) The salt draws out moisture (and thus bitterness) through osmosis -- after 30 minutes or so, drain and dry the eggplant thoroughly, then continue with your recipe. 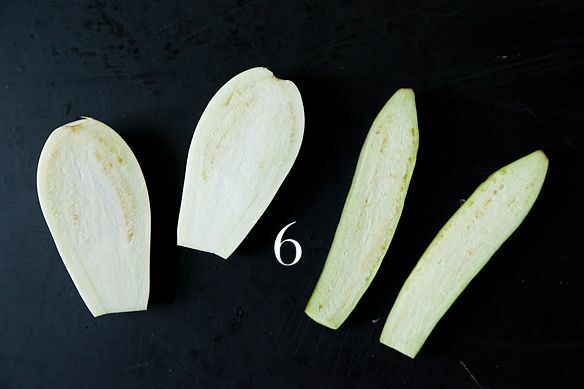 If the seeds of the eggplant are very large, you can remove them with the tip of a knife. When roasting eggplant for dips and spreads, be sure to prick the skin with a fork in several places -- you don't want exploded eggplant flesh on the ceiling of your oven, do you? The eggplant is done when the skin is totally slack and browned all over -- then you simply peel it and continue on with the tender insides. 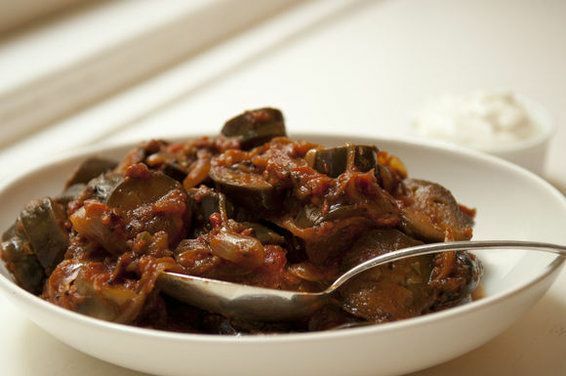 Eggplant's meaty texture and versatile flavor profile makes it a star in cuisines from Italy to India. 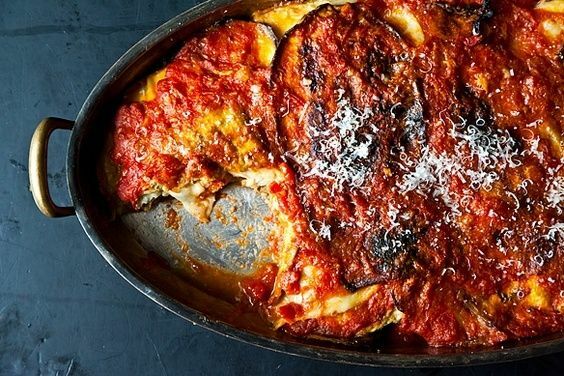 Stuffed, grilled, or simmered, there are plenty of FOOD52 eggplant recipes to go around! Thanks for the post.. Just incited an intense craving for having some spice free eggplant bharta! Here's the recipe..